NEWARK, New Jersey (WABC) -- First lady Michelle Obama is planting a garden in the Garden State. 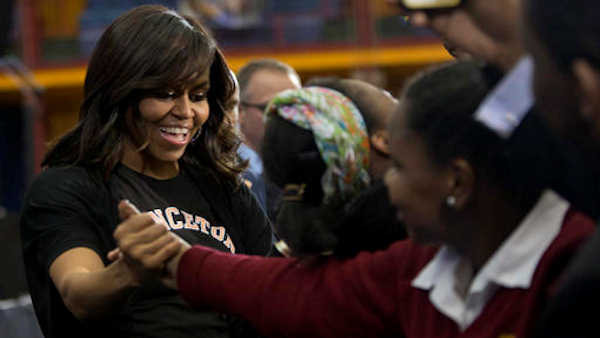 Obama helped students at Philip's Academy Charter School in Newark plant a garden on Thursday. The school created a program to show students how food is grown and how it helps them make healthy choices in their lives. The school links a rooftop garden, teaching kitchen, indoor growing lab and dining room to connect core curriculum with food literacy. Central Avenue between First Street and Norfolk Street was be closed between noon and 5 p.m. because of the first lady's visit. Newark police advised motorists to allow extra time and anticipate traffic congestion. The first lady's American garden tour highlights the impact and benefits of gardens across the country.